Chiropractic weekly tips contribute to the small things that often make a difference. Along the way, every clinician learns small things that can make a huge difference. Like, if you have a cervical spine problem, and must go for a general, please make sure the anesthetist knows about it. Holding the neck in extension for a couple hours can cause months of misery. A sudden twist to the side to avoid sneezing on your computer screen can have a serious affect on your lower back if it's a vulnerable spot. Two minutes spent every morning before arising doing a few lower back exercises is probably the most important single thing you can do for your spinal health; that's all it takes. Of course, repeated in the evening would be better still; browse the navigation bar on your left. If you want to seriously upgrade your health then consider making your own hummus and enjoying it daily on a green salad. Once you're in the groove it takes only five minutes. If you have the crossed sciatic sign where straightening your one leg causes pain in the opposite leg then take your chiropractor's advice very seriously. You may be on the verge of surgery. If you have generalised muscle and joint pain consider getting onto an anti inflammatory diet; that means daily enjoying foods rich in omega-3, like fatty fish and freshly ground flaxseed. There then are the chili family, olive oil, coloured foods in general like butternut. And avoiding the inflammatory foods containing white flour and sugar for example. Despite the best will in the world, occasionally you'll miss a consultation. Sometimes it may even be your chiropractor's fault. If you have chronic problems and are under maintenance care, make sure you apologise and reschedule. Discuss fully with your DC what your expectations are from the treatment. I've recently been treating an older person with quite severe spinal stenosis causing deep ache and tingling in the lower limb. The pain was much improved but not the tingling and he's gone for major surgery. I realised we never discussed fully what the prognosis was. Now to see if the operation will cure the paresthesias. If you or a loved one have had a total hip replacement, and you are still really battling, have your chiropractor check the sacroiliac joint. It often becomes totally fixated, locked like concrete, with an arthritic ball and socket; then, if it's not released after the operation walking remains problematic. Deep soft tissue therapy down the ITB and in the adductor muscles is often very beneficial; you can even do it to yourself. Surgeons are now finding that use of Charnley cement in fixing hip cups has a 13% failure; they come loose; discuss the advantages of a fusion. The medial lumbar disc protrusion usually responds very quickly to chiropractic care, but it still takes 6 weeks to heal; it's very difficult persuading the patient, when the severe pain has gone inside of a week, that they have had a serious injury, and must wait the full month and a half before getting up to mischief. A second episode will almost certainly end up with radiating pain down the leg, and more drama. Must you have your wisdom teeth extracted? Plead with your dentist to do it in the chair. 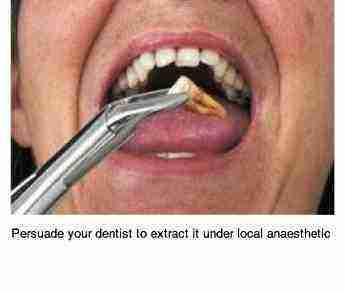 Under a general anaesthetic it can cause horrors to your jaw joint, when forced too wide. Lifelong migraine headaches may be the result. We see this injury commonly to the TMJ anatomy; an important chiropractic weekly tip. Chiropractors and medical doctors aren't right all the time. In fact studies show they get the diagnosis right less than half the time. Nevertheless you need good reasons to ignore your doctor's advice. If you suffer regularly from neck pain, on awakening, just lie quietly. Don't stretch, don't move, just gradually regain consciousness. It's very significant that very acute episodes of neck pain often begin moments after wakening. Going for surgery and a general anaesthetic? If you have a neck problem, always tell the anaesthetist. Extension of the cervical spine for a prolonged period can result in months of neck pain. Suffer from chronic lower back and leg pain? Half the solution is a series of chiropractic adjustments. The other half is lower back exercises faithfully done every morning before arising; my most important chiropractic weekly tip. Foods that lower cholesterol ... really it's not rocket science. My cholesterol is 160 (4.2) and I LOVE food; you really can have butter and eat it. 50% of Americans are taking AntiCholinergic drugs ... anticholinergic side effects include forgetfulness, mental fogginess and confusion! Becoming forgetful...? Always be careful for a day or two after your adjustment. Your back may be fragile. You would do the same after a new filling or a groin hernia operation, and it also applies after a Chiropractic adjustment. 80 percent of a group of fit young men with low back pain had a short leg, half of them less than 5mm. Can Chiropractic help? Constipation is a killer. Literally but there's a simple solution. Type constipation into the search this site facility and look for beetroot and prunes. If you're a smoker quit for the duration of your sciatica pain, or don't bother with chiropractic. In fact, don't go the surgeon either; they also bemoan the fact that you won't heal well. Denied its full complement of oxygen, that disc just won't respond to any treatment. Don't be hasty with severe lower back and leg pain and rush off the doctor; remember you have a significantly high likelihood of ending up under the knife if you first consult a medical person. Don't expect the severe pain to be lessened with the first two or three treatments; folk sometimes get panicky, rush to the doctor, and end up unnecessarily in the surgeon's arms. But if you are not 50 percent better in the three weeks, you should be considering a second opinion. A short lower limb is one of the main causes of a scoliosis. Search for leg length inequality. Under treatment for low back pain? For most, but not for all, depending on the diagnosis, it's better to sit less and avoid so called comfortable chairs, the couch and the car as far as possible. Always use the hand rail on the stairs. Why? At chiropractic help clinics we regular see shocking injuries like this ankle joint pain casefile. There's interesting new research shows that sedentary seventy year olds who started walking three hours a week actually grew their brains, as seen on mri. Along with fatty fish and freshly ground flax seed, it's probably the best thing you can do to keep senility at bay. It's never been researched but I believe a joint shouldn't be manipulated more than perhaps twenty five times in a year, and that may be far too much. It will be extremely difficult to research, but like too many drugs, though they save lives, excess is detrimental. Regularly, people who crack their own spines come into our clinics, and it's always bad news. Popping the neck without distraction, ten times a day, causes terrible injury to the cartilage. You're certainly not saving money. One proper adjustment every 4 to 6 weeks, some exercises and a regular massage will save you from a terrible ache down the arm; and a visit to the neurosurgeon. Never carry a child on your neck and shoulders. Are you relocating? Do yourself a favour and hire a removal company. Their staff are equipped and experienced to move your piano, the stove, the dining room table. Yes, you will pay, but it will be much cheaper than paying for chiropractic help; less painful too. If your holiday is going to be one mad rush, take a tip from chiropractic help. Enjoy a few days at home first, having a holiday. Otherwise you are likely to get sick, or hurt your back, or drop dead. It happens often on holiday. You have no idea how many letters I get from readers on the subject of untreated ankle pain causing serious problems down the road. My chiropractic weekly tips include getting your ankle sprain evaluated by someone expert in its management if you know you've had a significant injury. A common, and really often simple to fix, is a subluxated talus or calcaneus; it's not seen on x-rays and often assumed there is nothing wrong. It causes incredibly sharp pain on walking in the initial phase; the fixated joint then gets immobilisation arthritis if not reduced; and it's usually simple to do. There'll regularly be more chiropractic weekly tips.